A sweeping, threaded narrative of the global phenomenon known as the Vampire Wars! Mankind is silently infected by a millennia-old bacteria unknowingly exhumed by a scientific expedition in Antarctica. Now, in some rare cases, a person's so-called "junk DNA" becomes activated, and depending on their racial and ethnic heritage they begin to manifest one of the many diverse forms of the "others" that are the true basis for the legends of supernatural creatures. These aren't your usual vampires and werewolves - it goes much deeper than that. 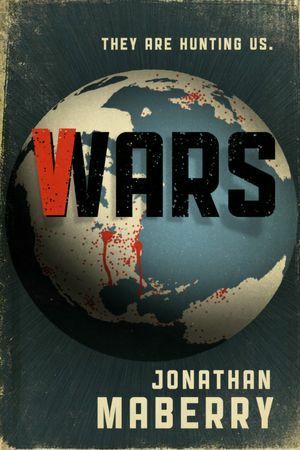 Conceived by Jonathan Maberry, V Wars features stories from various "frontlines" as reported by such contributors as Nancy Holder, Yvonne Navarro, James A. Moore, Gregory Frost, John Everson, Keith R.A. DeCandido, and Scott Nicholson (as well as Maberry himself, of course). The result is a compelling series of tales that create a unique chronicle of mankind's response to this sudden, hidden threat to humanity. For readers who enjoyed: World War Z, Robopocalypse, 30 Days of Night and Zombies vs Robots. I really am bummed I didn't finish this book. Jonathan Maberry is best known for his Zombies (which I love) and I as soon as I saw he was tackling vampires I knew this was a book I had to request. Sadly I just found it hard to connect with this story. First of All, I really hate a plot filled with flash backs,flash forwards,flash sideways. Yes, they can work but personally I found it hard to follow. This isn't a review because I only managed to make it to page 125 before admitting defeat. In my mind it isn't fair to judge the book as a whole since obviously I didn't finish it. The kicker of it all is individually the writing is great, some very strong writers are included in this book and alone any one of them could've produced an awesome,cohesive story. In this instance, with this plot, the anthology style just didn't work for me(again personal taste). Therefore even though I gave up on this book definitely still try it. I've seen a couple really favorable reviews and if this style works for you, then by all means give it a go. Anyway....I guess that is about it. Have you read this book? Do you like flashbacks,flash forwards and flash sideways? Let me know in the comments below, I love reading your responses.